Riverside Auto Sales is a 100% Canadian used car dealership located in Guelph, Ontario. We are locally owned and operated and have been serving this area with quality pre-owned vehicles since 1995. 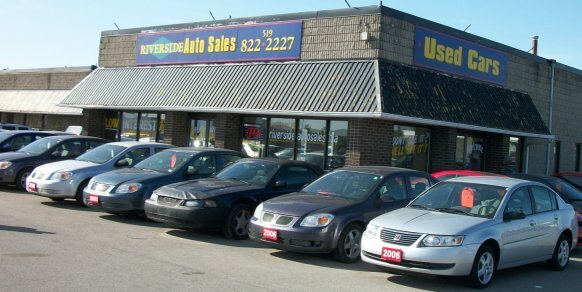 In 2002 we had outgrown our lot, and we moved to a spacious prime location in the Guelph Auto Mall. Since 2005 you can also have your car serviced by Riverside Auto Sales & Service. Serving Guelph, Waterloo, Cambridge, Kitchener, Brampton, Fergus, Elora & all surrounding areas. Also within driving distance of Milton, Halton, Peel, Mississauga, Hamilton, Burlington or the Greater Toronto Area (GTA). Our commitment is to your satisfaction for your used car purchase and auto service. We offer used cars of all makes and models, in all price classes. Our knowledgeable staff will help you locate the vehicle you are looking for. At Riverside you can Buy With Confidence.